Soccer Euro 2008 Germany Turkey, originally uploaded by vfb63. There seems to be just one interview held back from the weekend, the one with goal scorer Nicklas Bendtner which is in both The Sun and The Mirror. Our young Danish striker says he's ready to fill the void left by Robin Van Persie's injury. He's talks of being in the treatment room and how difficult it is for a top flight player to be out. And how now more than ever it is important we keep a momentum going and win our remaining games. "It was very important for us to win. "We won and United lost and dropped points and that's how we want it to be. "Of course we believe we can win the title. We believed it at the start of the season and we still believe it now — we'll fight every minute of the way." Many of the nationals, including The Times, suggest Theo Walcott's non inclusion in Stuart Pearce's England Under 21 squad will mean he'll be called up by Fabio Capello for England's friendly with Egypt at Wembley a week tomorrow. A couple of Arsenal's invincibles have been speaking. Gilberto Silva gave an interview to the Daily Telegraph ahead of Brazil match with Ireland at the Grove. He speaks of great affection to the club, his memories and watching the side from Greece. As someone who was once inside the club it's interesting to read his perception of how the season could end and he believes Arsenal can win the league. "Arsenal need to achieve the first trophy to feel that they can do it because for a player it is frustrating when you go through a whole season and have been close, but at the end you don't get the reward for your job. I'm sure if Arsenal win their first trophy, they are very young and their confidence will be higher and they can win more and more. It's up to them to believe that they can do it." 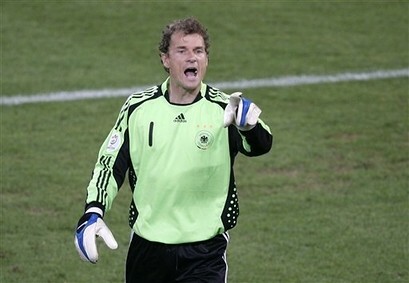 The other invincible is Jens Lehmann who talks to the Daily Mail. He's writing a book, which is going to be an interesting read to say the least. Lehmann doesn't talk at all about the current Arsenal team or leaving London, but does go back to recall the famous penalty incident with Ruud van nistelrooy. The most interesting talk in this interview is about his book. "I'm writing a book. So I'm keeping that. It's due in May. But I don't want to hurt myself. I have a decision: if I never, ever want to work in football again, I can write a great book. But, just in case I want to stay in the game, I can soften it. The decision hasn't been made. "Arsene Wenger doesn't need to fear anything. He already knows I'm angry because he didn't pick me in my last year — but only on a professional basis."